Tribal tattoos account for nearly a third of all new tattoos inked globally, which has grown ten folds over the last few years. There is no doubting they look fantastic, but do most people really know the meaning behind them? This article delves into the history behind tribal tattoos, to give you a better understanding of why they came about. 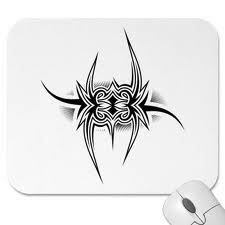 In ancient times, tribal tattoo art was popular as it is today. First and foremost, as the name "tribal" suggests, people were inked to identify clans, tribes and families. Not only did this enable them to easily identify one another, or recognize distant relatives, but it was generally believed that the tattoos would allow people to find their tribe and join it again in the afterlife. In addition to the above, men and women also used to "wear" a marriage tattoo in certain tribes. This would essentially serve as the modern day wedding ring and again, would allow a person to find their spouse in the afterlife. Although with the high rate of divorce we currently see, maybe one lifetime is more than enough!!! In modern times, this form of tribal tattoo is still prevalent, and you will often see spouses with matching tattooed armbands, rings or initials, showing a permanent marking of their love and fidelity. Another reason for tribal tattooing was for young adults approaching maturity. By having a tattoo, they would then be socially accepted as an adult. However, a woman who couldn't bear the pain of a tattoo would be unfit for the impending pain of childbirth - making her unacceptable for marriage. Quite harsh we think, but different strokes for different folks! A young man who couldn't withhold the pain of a tattoo would be seen as unfit for battle or hunting and would therefore be seen as an outcast and not a valuble as others. Too right! So if you are thinking of getting a tribal tattoo, these are some of the reasons why we have such stunning designs in the modern day. Honed over hundreds of years, we advise you to find out the meaning of any design you may want. It could turn into a great bar story too, or even one for the grand kids! The internet would be a great place to start you research, and even tattoo parlors these days, would surely know what most of the meanings are before they put them to skin.